Quality carbohydrates and rehydration could be the key to enjoying your snow trip. A trip to the snow is one of the most magical winter experiences. Whether it's to ski and snowboard or just to wander and play, the glistening mountains are the perfect place to get active in nature. The cold weather, higher altitude and potentially intense physical activity mean it's important to stay well fuelled and hydrated, and to take care of yourself and your family. Here are some tips for making the most of your trip. The combination of altitude, cold weather and dry air increases your need for fluids. You often don’t feel thirsty in the snow, which can quickly lead to dehydration. At moderate or high altitude, the kidneys play a crucial role in regulating body fluids. The lower oxygen levels can lead to hormonal changes, resulting in more fluid loss through breathing, sweating and an increase in urine production. Making sure you are well hydrated will also help prevent muscle damage and keep you skiing on the slopes longer. Don’t wait until you're thirsty to have a drink. Carry a small bottle of water or better still, a backpack with a small hydration pack in it. Drink frequently before you leave the lodge and while on the slopes. Sports drinks may be useful to help you retain fluid and also meet your increased carbohydrate requirements. Warm drinks may also be more inviting in the cold, so stop in at the chalet for a hot chocolate! If you drink alcohol, don’t overdo it - especially after any injury. While alcohol is very much part of the ‘après ski’ culture, it should never be confused with rehydration, because it actually has the opposite effect. Alcohol is a diuretic, which can lead to dehydration due to an accelerated loss of fluid from the body. Alcohol is also a depressant (not a stimulant as some might think) and can impair your motor skills, slowing down your reaction times and reducing your concentration and decision-making ability. 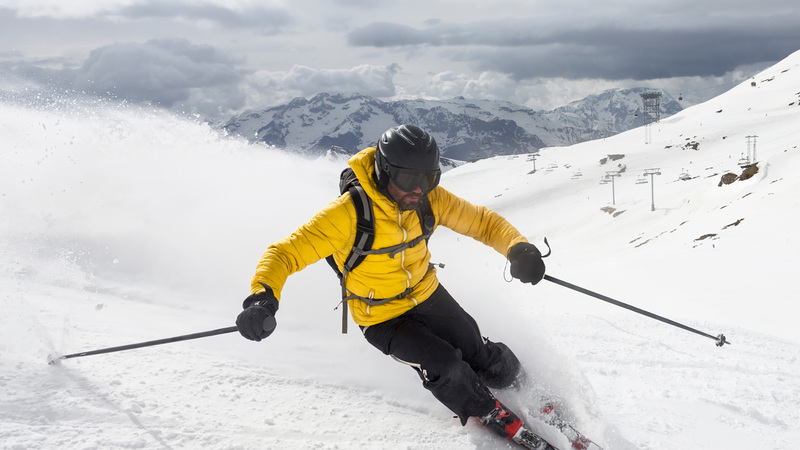 All of these skills are vital to keep you skiing at your peak and reduce your risk of injury. Alcohol also dilates the blood vessels, increasing blood flow to injured tissue, which slows down recovery. Quench your thirst with a non alcoholic drink after a day on the snow to rehydrate. Eat before or while you are drinking alcohol, and alternate alcoholic drinks with non alcoholic drinks. When skiing at high altitudes, there is less oxygen, and therefore the air is dryer than at sea level. This can lead to hypoxia, a condition where there are low levels of oxygen in the blood – which means a poorer supply of oxygen to vital organs in the body. Low oxygen levels can lead to symptoms including headache, malaise, nausea and vomiting. This is commonly known as altitude sickness. At high altitude, your need for carbohydrates is increased. This is because when your body uses carbohydrates as fuel, it produces higher amounts of carbon dioxide when compared to fat and protein metabolism. Carbon dioxide production results in an increase in breathing, which increases oxygen delivery to the tissues. Carbohydrates are usually stored in the body as glycogen, and these stores are rapidly depleted at high altitudes to keep up with the increased demand. Skiing can lead to muscle damage, and good sources of protein and carbohydrates are required to repair the damage and get you back on the slopes quickly.